TRAVELING THRU MEXICO AND DON'T KNOW WHERE TO EAT AND STAY? I spend my winters in Mexico. The places I recommend are safe, delicious and clean. And very inexpensive. I ONLY RECOMMEND PLACES I GO TO REGULARLY. YOU CAN'T PAY ME TO GET ON THIS SITE. Here is a YOUTUBE Player containing video reviews of the ALL best places to eat in Alamos, Sonora, Mexico. Want to know more about historic Alamos? 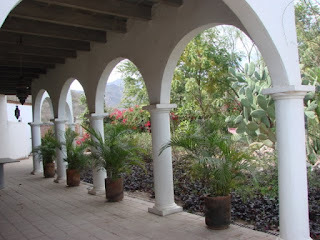 Here is a LINK to a YOUTUBE playlist of my prize-winning videos of Alamos, a HISTORIC TOWN IN THE MOUNTAINS OF SONORA. Click here for a detailed video of the house and grounds. If you know of any restaurants you think should be on my list, let me know. If you find any of the restaurants I've recommended have not lived up to my estimate of them, I'd also like to hear about it. Click here to return to main page: JUSTIN SPRING's GUARANTEED BEST PLACES TO EAT"